Published by Holyoake Books (the imprint of the Co-operative Union). This is the history of one of the world’s most remarkable women’s organisations. When the Guild was founded in 1883, working class women had no public voice and were widely exploited at work and in the home. The guild quickly became one of the first radical feminist groups to identify and challenge sexual prejudice and oppression, and to fight for change. 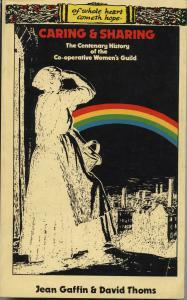 Guildswomen were active in the campaign for maternity benefit, and improved infant and child care facilities. They defied convention by demanding easier divorce, and in the 1930’s bravely supported the peace movement by initiating the famous White Poppy Campaign. By 1939 the Guild’s 87,000 members belonged to an organisation of national reputation and importance. After the upheavals of the war guildswomen continued to campaign vigourously for a wide range of radical social policies. The Guild continues to provide an outlet for the campaigning, creative and caring interests of its members. The stirring events of the Guild’s foundation and its campaigns, as well as its adjustment to the changing social and economic environment of recent decades, are recounted in this history. The book wil be of special interest to Guild members, but it will also appeal to anyone with a concern for women’s role in society. It is also an important addition to the academic literature of the women’s movement. A postscript reviewing the ten years since “Caring and Sharing” was first published in 1983 has been included in this second edition.